Yo Occupy! Let's help Rami Shamir publish a new edition of TRAIN TO POKIPSE, the novel that's been called a Catcher in the Rye for the Occupy generation. What is THE END OF PROTEST? In a move reminiscent of Bush era fear-mongering, the Obama Administration has released to corporate media a vague bulletin warning of possible terrorist attacks on the anniversary of Osama bin Laden’s death. While the actual date of bin Laden’s death is May 2nd, many media outlets (including the Huffington Post, Fox News, the New York Post, and Gothamist) have reported the date as May 1st. In reality, President Obama announced the successful mission just before midnight on May 1st EST, but bin Laden was killed on May 2nd Pakistan time. The Associated Press, who were the first to report the bulletin, correctly cite the date as May 2nd. During a Senate hearing Wednesday morning, Homeland Security Secretary Janet Napolitano said DHS efforts "to get information, tools and resources out of Washington, D.C., and into the hands of state and local officials and first responders" have "led to significant advances" in protecting the homeland. The Federal Protective Service will deploy additional personnel beginning May 1, bringing in more people from out of town and outfitting them in “battle dress uniform.” They will be carrying “non-lethal” long guns — bean bag weapons — in a show of force that at the same time will allow people to move in and out of the zone freely, federal employees were told. Just months after Obama signed the NDAA “indefinite detention” legislation into law, federal officials’ intentions to drastically increase security for May 1st conveniently coincide with the May Day General Strike in over 120 cities across the U.S. President Obama has already deported more immigrants than the Bush Administration; failed to close Guantanamo; does not meet the needs of the veteran returning from combat; continues to prosecute whistle-blower Pfc. Manning for taking an ethical stand by exposing horrendous U.S. war crimes; frequently invokes “state secrets” to carry out unaccountable, covert spying on U.S. residents; and continues the widespread use of unilateral drone strikes and targeted political assassinations. 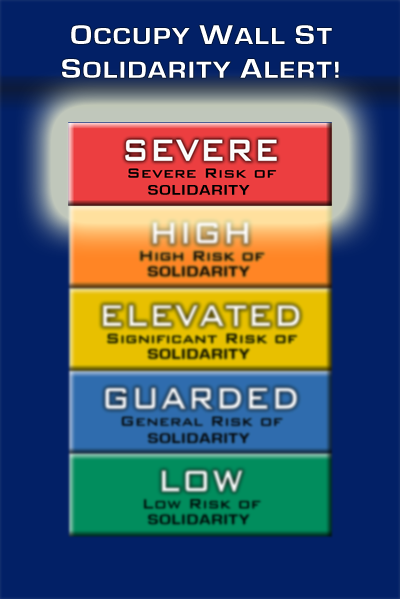 In response to the U.S. government’s escalating repression, thinly-veiled Islamophobia, and attempts to militarize our cities and borders while scapegoating immigrants, OccupyWallSt.org hereby issues our own warning: A Solidarity Warning to the 1% and their beneficiaries and bodyguards in government. The 99% will not be intimidated or divided. We will stand together and protect one another. We will not be terrorized. We will not be afraid. Further, we reject any attempt to co-opt May Day -- an historic, international celebration of labor and immigrants rights -- by the government or media. For over a century, May Day has been a day of militant resistance against economic inequality. In the 19th and 20th centuries, the 1% used the imaginary threat of an immigrant-led Communist conspiracy to ensure May Day (which commemorates events in Chicago) would not become a federally-recognized holiday in the U.S., as it is in over 80 countries. Instead, they attempted to re-brand May 1st variously as Americanization Day, Loyalty Day, and Law Day. We must not let them do it again. Through the Red Scare to the War on Terror, we must honor the true history of May 1st. As we have seen countless times throughout history, we cannot rely on politicians from any political party to sincerely look out for our interests. They serve only the wealthy financial elite. We must stand together as the 99%. However, we must also recognize that the State’s “anti-terrorism” efforts target particular communities within the 99%. This May Day, organizers are taking precautions to ensure the fullest protection possible for undocumented and/or criminalized communities who wish to exercise their right to free speech safely on May Day. See here for more information on ways everyone can take part in May Day festivities! And remember: If you notice suspicious people in uniform carrying weapons or plotting to spread fear through well-coordinated violent attacks on civilians on May 1st, alert your local Occupy community. If you see something wrong with racism and vast income inequality defended by a militarized government in this country, say something with us in the streets this May Day! Bullets can't kill an idea whose time has come. They don't need bullets. They have TV's.